Shortly after the game she sent me a text message thanking me. This is what I replied: "You know, some people were telling me how great I was concerning YOUR hitting. Let me tell you something: YOU are the one doing the hitting in the games, NOT ME! I have taught all the high school girls as I have taught you. As they say, "Results may vary." I just want YOU to know that the smile on my face was not from any praise anybody was giving me. It was from watching you be successful knowing how hard you work for it. WE are going to have fun this year. You keep working hard and stay humble. See you later." I meant what I said. Don't get me wrong. I like a little pat on the back as much as anybody. And I do appreciate the generous words and compliments from other coaches and parents. But, I've got some girls who are struggling too and I am trying to figure out how to help them. Shouldn't my coaching success be measured by their results too? But, how do you interpret results to define success? That's because the definition of success for every player is different. It is impossible for a player to be the best they can be, since that would be perfection. All he could do as a coach was to help players strive to be the best they could be on any given day. He wouldn't know if he was successful with each player until 20 years after they left his guidance. He was referring to their lives, not their games. For him success was defined by if he could help his players be as close to their best as possible and if they would go on to lead good lives. For myself helping the girls learn and enjoy the game, improve their skills and learn life lessons is how I define success. I wrote an article specifically about hitting that details some of the issues coaches, players and parents encounter, Hitting: Lessons, Results & Realities. However, the point of this article is not just about hitting. It's about all aspects of the game. A coach can look real good if he's blessed with gifted athletes. Coaches can coach, players can work hard and parents can support them, but it's up to the player to get it done in the games. Two girls can put in equal work to improve their games, but have very different results. But, it may be the player appearing to be the least successful who in fact was the most successful. That's because the definition of success for every player is different. The definition of individual success for two players may be to have a fielding percentage of .950 or better. They'll measure their own results to determine if they were successful. Success concerning these two players may be defined entirely different by their coach and in other ways still by their parents. The one way their success should not be defined is by comparing themselves to each other or anybody else for that matter. In the case above a fielding percentage of .950 for a First Baseman cannot be compared to that for a Short Stop. The same would be true trying to compare the Catcher from last year's team to the Catcher on this season's team. The point is this: Whether you're a coach, parent or player, keep things in the proper perspective and when you experience success as you define it, be grateful and humble. There's no shortage of the opposite type of people we encounter in our daily lives. Rise above egotism, arrogance and pride. 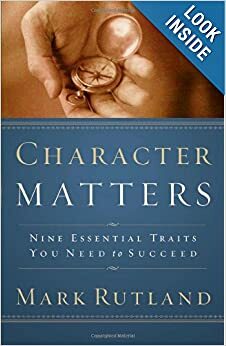 I found a great read last year, Character Matters: Nine Essential Traits You Need to Succeed, by Mark Rutland. One of the traits is Modesty, which I'll paraphrase as this: "Be real. Quietly comfortable with one's own success, neither prideful or self-promoting, nor displays a false humility as someone who is inwardly arrogant. It is having a tempered and humble estimation of one's own importance. They keep their emotions under control. It is passion under control." The nine character traits include: Courage, Diligence, Loyalty, Modesty, Frugality, Honesty, Meekness, Reverence and Gratitude. I highly recommend this inspirational eye-opening book for anybody at any age seeking to be the best they can be and to live a good life.